Jay in his septic tank. 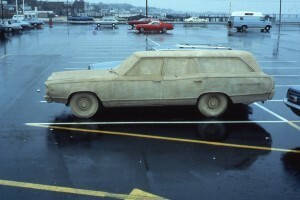 The summer long sand car. The Provincetown artist, Jay Critchley, is a merry prankster in the Dada absurdist tradition that ranges from Marcel Duchamp to Ken Kesey and Wavy Gravy. Like Saul on the Road to Damascus he was blinded by the light of art and catapulted from the hobby horse of a conventional life. Visiting P’Town with his then pregnant wife they divorced shortly after the birth of their son. The former altar boy came out and the catharsis of that rebirth energized him to make art by any means necessary. 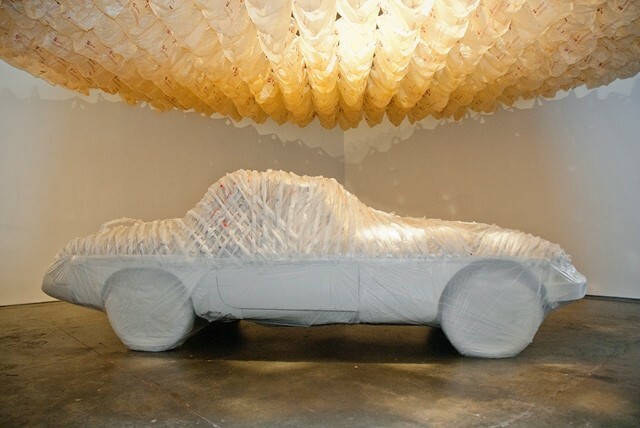 His primary mode of creation has been conceptual and performative. But unlike a formalist approach of ars gratia artis his work often makes a very specific point. It is fair to say that his approach makes people more aware of issues, contributes to society and, yes, saves lives. 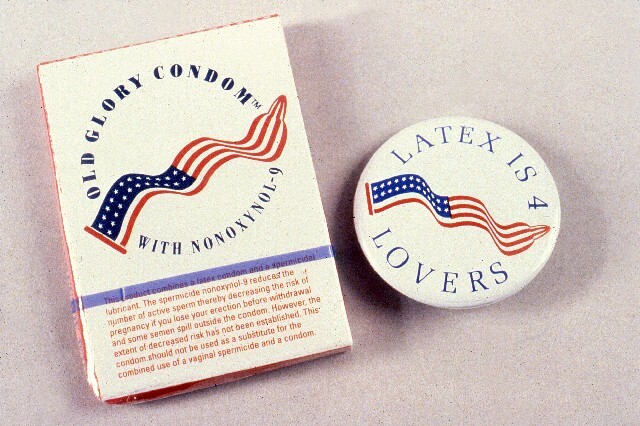 Inspired by the AIDS crisis, for example, Critchley designed and sold Old Glory condoms. 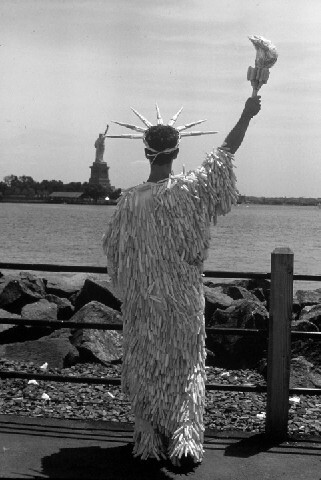 While walking the beach he began to gather the plastic tampon applicators that washed up through sewer systems. He fabricated a long gown for the persona of Miss Tampon Liberty. With wicked wit he makes us wonder why corporate America can’t solve such massive contamination. His points are often so sharp and compelling that it is impossible not to laugh and cry. Some of his over the top stunts have become much anticipated annual events. Like ReRooting Day for all those abandoned Christmas trees trashed after the holidays. Noting the clear water off P’Town he and a friend challenged themselves with a swim from Long Point to the town wharf. A couple of weeks later 24 swimmers participated. Now some 350 of so take the annual plunge. Provincetown Harbor Swim for Life has evolved into a big deal. It is well organized with concerns for safety. The event has raised nearly $4 million for a selection of charities. It is always fun to catch up with Jay and learn about his latest capers. He scrutinizes me to see if I comprehend or am on board with often gonzo ideas. When I shrug or appear apathetic that evokes an outburst of infectious laughter. What follows is the press release from the Provincetown Art Association and Museum. Jay Critchley, Incorporated is the first-ever museum survey of Provincetown artist Jay Critchley’s work, spanning more than 30 years. The opening of this exhibition and Members’ 12×12 Exhibition and Silent Auction occurs on Friday, May 8 at 7pm. 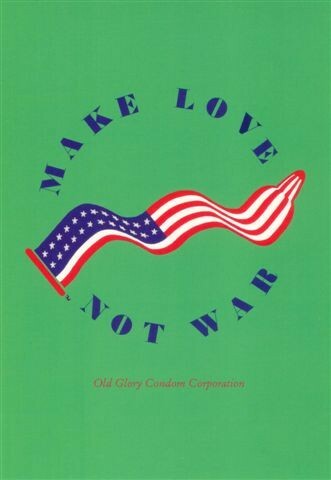 Artist and activist Jay Critchley's visual, conceptual and performance work has traversed the globe, from his patriotic Old Glory Condom Corporation Worn with Pride Country-wide, and the Blessed Virgin Rubber Goddess Immaculate Protection, to Miss Tampon Liberty and the Nuclear Recycling Consultants. 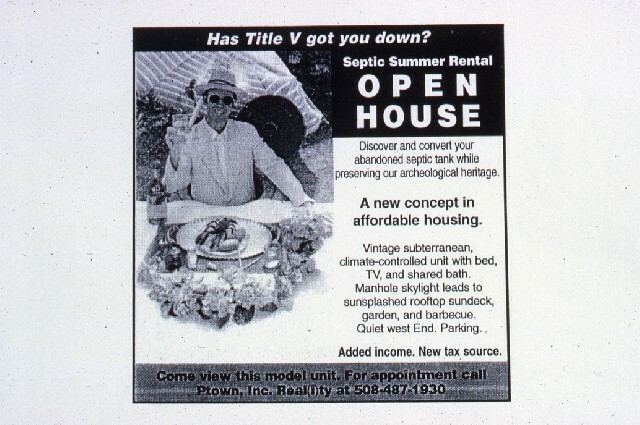 He lives year round in Provincetown , Massachusetts where he founded and directs Theater in the Ground @ Septic Space in his backyard septic tank. 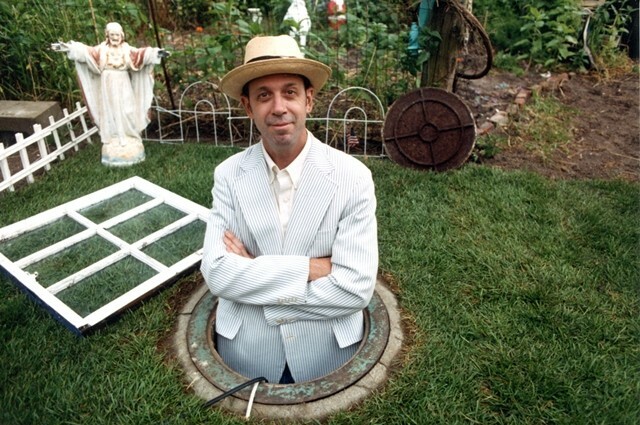 He has produced, written and directed two movies: Toilet Treatments, HBO Audience Award at the Provincetown International Film Festival 2002, and, Providence Dirt Newsreel 2002. He produced a CD, Big Twig Tunnel Tapes Â– Boston 's Big Dig Sings, recorded 125 feet below the city before the tunnels opened for traffic. In 2007 he was featured in an exhibition on global warming at the Andy Warhol Museum and in a show at The LAB in San Francisco, and he was invited to present his work at the 6th Encuentro of the Hemispheric Institute of Performance and Politics in Buenos Aries, Argentina. The ongoing BEIGE Project entailed BEIGE MOTEL ? a sand-encrusted 1950s, A-frame on Rte 6, North Truro, Cape Cod,. It was demolished in 2008. Jay has taught at the Museum School of the Boston Museum of Fine Arts, and has had recent residencies at Harvard University, AS220 in Rhode Island, and Harvestworks Digital Media Arts Center in New York City. 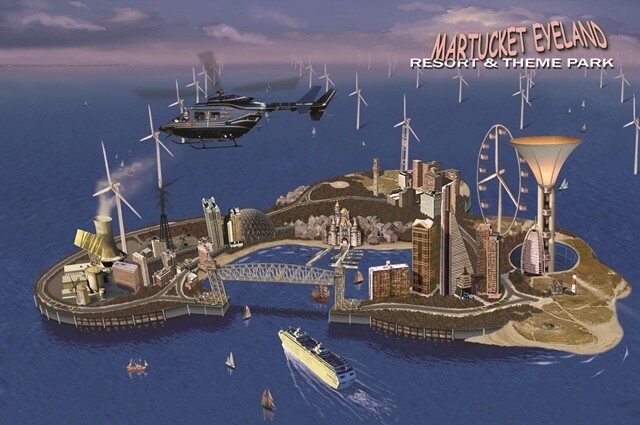 He was awarded a Special Citation from the Boston Society of Architects' Cape Wind Competition for his proposal, Martucket Eyeland Resort & Theme Park, which has toured Holland, Germany and England. He runs the annual Provincetown Harbor Swim for Life benefit. 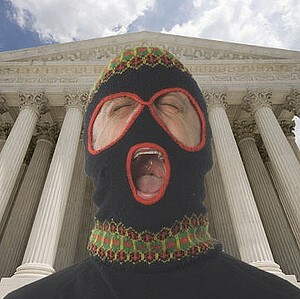 His personas and enterprises have challenged the dominance of corporations in a democratic society. 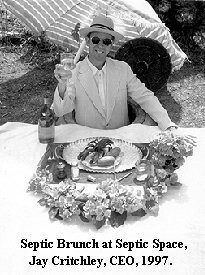 He is founder and President of the NRC, (Nuclear Recycling Consultants,) TACKI (Tampon Applicator Creative Klubs International), Old Glory Condom Corporation (worn with pride country-wide the patriotic condoms imprinted with the American flag), and the IRS (International Re-Rooters Society), with its annual ritual and the burning of a Christmas tree/boat at sunset in Provincetown Harbor. He is also founder and director of the Provincetown Community Compact and the annual Swim for Life, which has raised close to $4M for AIDS, women’s health and the Provincetown community. Critchley’s work is exhibited, performed and presented throughout the US, Europe, Columbia, Argentina and Japan. 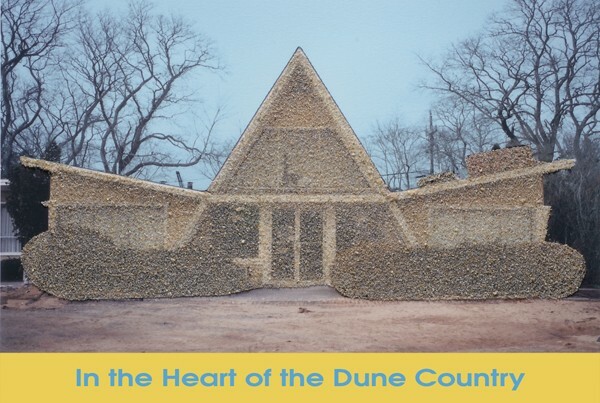 He has won awards from Massachusetts Cultural Council, Boston Society of Architects, Smithsonian-Cooper Hewitt Museum in NYC and an HBO Audience Award at the Provincetown International Film Festival. He has been awarded artist residencies at Williams College, Harvard University, AS220 in Rhode Island, MilePost5 in Portland, Oregon, Harvestworks NYC, and Fundacion Valparaiso, Almeria, Spain and CAMAC, Marnay sur-Seine, France.